Pakistan’s Agricultural Innovation Program (AIP) tested more than 700 diverse maize lines in an effort to develop more affordable, well-adapted maize varieties. 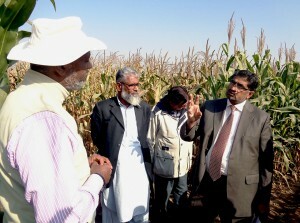 While visiting AIP maize trials, Dr. Muhammad Azeem Khan, NARC Director General, discusses NARC’s seed road map. Photo: Salman Saleem/CIMMYT. ISLAMABAD — Pakistan’s Agricultural Innovation Program (AIP) tested more than 700 diverse maize lines this past year, as part of its efforts to develop more affordable, well-adapted maize varieties. During two cropping seasons, 15 trials consisting of 680 diverse maize lines were conducted across Pakistan. AIP’s maize variety evaluation is the largest in the history of Pakistan, both in the number of varieties and of testing sites. Compared to wheat, which has had a stronghold in Pakistan since the Green Revolution of the 1970s, maize development and deployment activities are rather recent. Production of maize, Pakistan’s third most important cereal crop, is projected to keep on increasing over the next several years. Despite growth, 85-90 percent of maize seed is imported hybrid seed, which means the seed price in Pakistan is very high compared to seed prices in other South Asian countries. “The current seed price of US $6-8/kilogram is too expensive for resource-poor farmers to adopt improved varieties. That is why CIMMYT aggressively embarked on testing such a huge quantity of maize varieties. Pakistan is the new frontier for CIMMYT, and development interventions can have a quick impact,” said AbduRahman Beshir, CIMMYT’s Maize Improvement and Seed Systems Specialist. At its recently held annual meeting (8-9 April 2015), the AIP-Maize Working Group invited public and private partners to share the field performance results of CIMMYT maize varieties introduced from Colombia, Mexico and Zimbabwe. Some of the entries evaluated during the 2014 spring and summer season outyielded the commercial check by more than 50 percent. Sikandar Hayat Khan Bosan, Federal Minister of Food Security and Research, applauded AIP-Maize’s efforts after visiting the maize stall where AIP-Maize displayed a diversity of maize ears at a recent agricultural expo. “Pakistan’s maize sector is being activated by AIP-Maize. Location testing followed by provision of parental lines for local seed production is the kind of support we need to have sustainable interventions,” said Shahid Masood, member (Plant Sciences) of the Pakistan Agricultural Research Council (PARC) who presided over a maize working group with more than 45 participants. Based on a seed delivery road map, CIMMYT has started allocating the best performing varieties to partners, with three varieties already included in Pakistan’s maize register. Imtiaz Muhammad, CIMMYT’s country representative in Pakistan and AIP project leader, urged participants in the maize working group meeting to fast-track the deployment of CIMMYT varieties and distribute seed to resource-poor farmers. According to Beshir, Pakistan’s yearly bill for imported hybrid maize seed reached US $56 million during 2013/14, which makes maize the highest priced imported seed among all the cereals. “The foundation is now being laid to make Pakistan self-sufficient in maize seed,” he said. AIP-Maize is currently working with nine public and nine private companies representing the diverse ecologies of Pakistan. The AIP-Maize network is a platform for data and knowledge sharing, which helps to create synergies among stakeholders. Participants in the annual AIP-Maize Working Group meeting. Photo: Amina Nasim Khan/CIMMYT. Pakistan Agricultural Research Council (PARC), organized a traveling seminar to give stakeholders the chance to evaluate the performance of CIMMYT maize germplasm in Punjab Province, Pakistan. A new study reveals the need for continued development of maize varieities resistant to MLN and strengthening farmer resilience.